After the 2008 financial meltdown, the American crisis soon infected the European financial system, becoming both a sovereign debt crisis and a banking debacle in many peripheral Euro area countries. 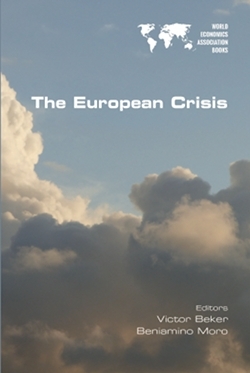 The European crisis spread quickly among closely integrated economies and the implementation of austerity policies reinforced a spiral of economic contractions and provoked a rising political rebellion. This World Economics Association book, edited by Victor Baker and Beniamino Moro, was written to address monetary, financial and debt issues, alongside the questions of social stabilization, strategies for structural reform and economic growth that may be re-considered to frame new economic perspectives for Europe. The call for reflection is persuasively made by the contributors: Jacques Sapir; Gerson Lima; Carmelo Ferlito; Merijn Knibbe; Enrico Marelli and Marcello Signorelli; Tom Vleeschhouwer and Tara Koning; Cristiano Boaventura Duarte and André de Melo Modenesi; Dimitri B. Papadimitriou, Michalis Nukiforos and Gennaro Zezza.